Tired of company making comments about the layer of soot that has been accumulating no matter how much you try to get rid of it? Kingsman is on your side and provides various parts for your stove or fireplace in order to diminish this problem. The Dura-vent ZDVDFA fireplace adapter is just the thing you need to keep the fireplace residue from infiltrating your house. With this vent, fresher air is produced throughout the house. Why pay the price to purchase new furniture when you can replace the vent for a way cheaper amount and with less hassle. Make the whole family want to spend time in the living room by ordering from Kingsman! Looking for a reliable and secure ventilation starter kit for your Kingsman stove? If you have a multi-sided direct vent fireplace from Kingsman, the Kingsman ZDVHSK Round Horizontal Chimney Vent Termination Starter Kit will give you the secure and efficient ventilation you need to keep your fireplace functioning well and your family safe. This vent termination starter kit is 36 inches long, and it comes with a wall thimble, all the screws, and a mill pac. Make your already-efficient direct vent fireplace from Kingsman even more efficient with this American-made vent termination kit. Looking for a reliable and secure ventilation starter kit for your Kingsman stove? If you have a multi-sided direct vent fireplace from Kingsman, the Kingsman ZDVHSK Square Horizontal Chimney Vent Termination Starter Kit will give you the secure and efficient ventilation you need to keep your fireplace functioning well and your family safe. This vent termination starter kit is 36 inches long, and it comes with a wall thimble, all the screws, and a mill pac. Make your already-efficient direct vent fireplace from Kingsman even more efficient with this American-made vent termination kit. Looking for a reliable and secure ventilation starter kit for your Kingsman stove? If you have a multi-sided direct vent fireplace from Kingsman, the Kingsman ZDVHSK5 Round Horizontal Chimney Vent Termination Starter Kit will give you the secure and efficient ventilation you need to keep your fireplace functioning well and your family safe. This vent termination starter kit is 60 inches long, and it comes with a wall thimble, all the screws, and a mill pac. Make your already-efficient direct vent fireplace from Kingsman even more efficient with this American-made vent termination kit. Looking for a reliable and secure ventilation starter kit for your Kingsman stove? If you have a multi-sided direct vent fireplace from Kingsman, the Kingsman ZDVHSK5 Square Horizontal Chimney Vent Termination Starter Kit will give you the secure and efficient ventilation you need to keep your fireplace functioning well and your family safe. This vent termination starter kit is 60 inches long, and it comes with a wall thimble, all the screws, and a mill pac. Make your already-efficient direct vent fireplace from Kingsman even more efficient with this American-made vent termination kit. Ensure that your home is safely ventilated with the Kingsman ZDVFK5 Flex Chimney Vent Kit with a 4 Inch Inner Diameter. Are you worried that your stove's direct vent and the wall ventilation won't line up properly? The practical flex ventilation material adapts to tight spaces and corners and allows you more freedom with the placement of your stove. The Kingsman ZDVFK5 Flex Chimney Vent Kit has a 4 inch and 7 inch diameter and comes with springs, screws, and a mill pac. Don't leave the safety of your family to chance. Purchase a Kingsman Flex Chimney Vent Kit today. Ensure that your home is safely ventilated with the Kingsman ZDVFK8 Flex Chimney Vent Kit with a 4 Inch Inner Diameter. Are you worried that your stove's direct vent and the wall ventilation won't line up properly? The practical flex ventilation material adapts to tight spaces and corners and allows you more freedom with the placement of your stove. The Kingsman ZDVFK8 Flex Chimney Vent Kit has a 4 inch and 7 inch diameter and comes with springs, screws, and a mill pac. Don't leave the safety of your family to chance. Purchase a Kingsman Flex Chimney Vent Kit today. Ensure that your home is safely ventilated with the Kingsman ZDVFK20 Flex Chimney Vent Kit with a 4 Inch Inner Diameter. Are you worried that your stove's direct vent and the wall ventilation won't line up properly? The practical flex ventilation material adapts to tight spaces and corners and allows you more freedom with the placement of your stove. The Kingsman ZDVFK20 Flex Chimney Vent Kit has a 4 inch and 7 inch diameter and comes with springs, screws, and a mill pac. Don't leave the safety of your family to chance. Purchase a Kingsman Flex Chimney Vent Kit today. Are you a contractor or housebuilder looking for quality products? Perhaps, you are currently working on your own home. The Kingsman product line has products and parts fashioned with durability and function in mind. The Kingsman FDVHT Horizontal Vent Termination is one of the many Kingsman's ventilation items. It was designed to be used in conjunction with the direct vent gas stove. The horizontal vent facilitates the movement of warm air as your stove operates. The Kingsman FDVHT can be yours today. Simply locate it by using its product id, kgm-fdvht. For your heating appliance and fireplace accessory needs, think Kingsman. Have you ever wondered which part or piece would work best for your house building situation or renovation projects? Consider any of Kingsman's product line for your home. The Kingsman products are consistently functional and durable. Do you currently have a Free Standing Direct Vent Gas Stove and are in need of a horizontal vent termination? The Kingsman FDVHSQ Square Horizontal Vent Termination is just the thing for you. It is designed as a part of the Direct Vent Fireplace Venting Components Collection. This item is proudly manufactured in the United States, and the Kingsman FDVHSQ will prove its worth and stand the test of time. The Kingsman product line offers numerous products designed with durability and dependability in mind, making them a great choice for your home. The Kingsman fireplace accessories are also made at the same design standard. The Kingsman FDVHSCU Universal Safety Cage for Horizontal Termination is a fireplace accessory. It is manufactured to be used in conjunction with direct vent stoves and made for horizontal termination. It may come as a part of the Horizontal Vent Starter Kit. Its product ID number is kgm-fdvhscu. The Kingsman FDVHSCU Universal Safety Cage allows you to make the most of your stove without compromising the safety of your environment. Those who have a house with a fireplace are familiar with the beauty and comfort it brings to the home. A fireplace can be both a source of heat as well as an enhancement to the design and decor of a living room or kitchen. The Kingsman line of products are consistently reliable and the Kingsman FDVHSS Horizontal Stucco Shield is one of those items. It is designed to protect the stucco siding from the heat. 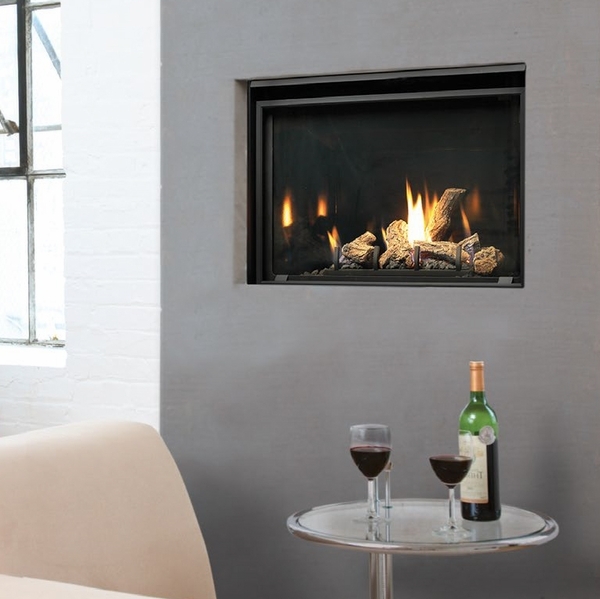 This fireplace accessory is manufactured to be used with direct vent stoves. Its product id is kgm-fdvhss. When adding a direct vent stove to your home, consider the protection necessary for using it safely. In every house with a fireplace, homeowners understand the delight a fireplace brings as well as the responsibility of it. When assembling the fireplace, one must be careful to follow the right steps and double check that the right parts and accessories are being used. Using a Kingsman product is always a step in the right direction. All Kingsman products are manufactured at the same standard. The Kingsman FDVVT40 Convertible Vertical Vent Termination is a reliable, functional product made at the Kingsman standard. It is convertible between 15' and 40' vertical. The convertible function allows for better flexibility and use. Are you bored with the decor of your home? Do you want to add character to a particular room? Is there a space you'd like to make more inviting, cozy or warm? A fireplace is one of the best ways to update a living area and add charm. When you are looking for a fireplace, go to Kingsman. Established in 1976, Kingsman has since been working to serve its customers with the best material, products, engineering, craftsmanship, and design. 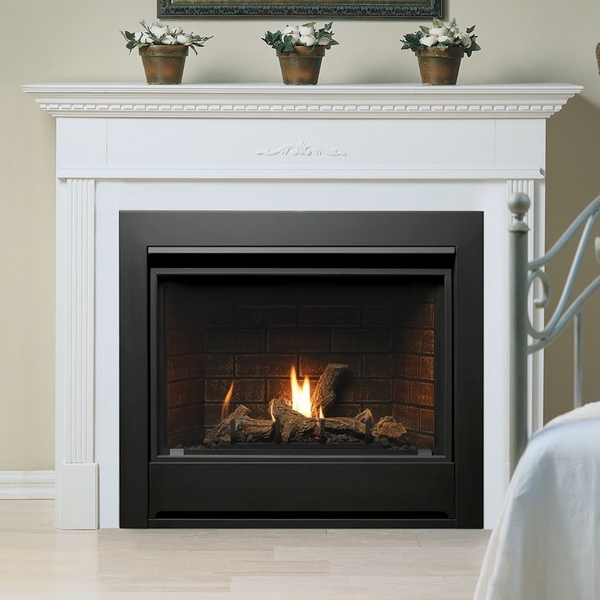 Their Zero Clearance direct vent gas fireplaces are top-of-the-line and can be the perfect solution for you. A fireplace adds a cozy ambiance to your living area, especially during the chilly winter months. As you gather all the pieces necessary to create a safe chimney, don't forget to purchase an attic installation shield. This shield will protect your attic and roof from the heat that escapes through the chimney. Kingsman provides a variety of quality fireplace products and this Kingsman ZDVAIS Attic Insulation Shield is no exception. The shield offers 12" of insulation designed to surround your chimney. Now you can enjoy a roaring fire in your beautiful fireplace and know that your home is safe from fire hazards related to your chimney. For chimneys with an offset angle below or above the roof, proper chimney support is an important feature to add to your ventilation system. Protect the stability and longevity of your ventilation termination today by adding a Kingsman ZDVVOS Chimney Vent Offset Support to your roof. The offset support is both classy and durable, non-invasive and efficient; you don't have to worry about the chimney support ruining the view, but it will support your chimney through inclement weather, including heavy rain, snow accumulation, and wind, as well natural wear from gravity over time. The support has been tested for durability and function. Kingsman knows that your family's safety comes above all other concerns--and that's why we supply a full line of products meant to keep your fireplace functioning safely and efficiently. The Kingsman ZDVFS Chimney Vent Firestop Spacer is made out of rugged metal that won't deteriorate in the short term, and it will ensure that your chimney vent is held at a proper length from any flammable surface nearby, such as the wall. Use the Kingsman ZDVFS Chimney Vent Firestop Spacer any time you pass a vent through a combustible wall, and enjoy your fireplace in safety this winter. If you have a freestanding direct vent gas stove from Kingsman, a chimney vent termination roof support is an important step in ensuring lasting performance from your chimney. The Kingsman ZDVRS Chimney Vent Roof Support will help your chimney function well through various circumstances: heavy wind, storms with heavy rain, hail, and snow accumulation just name a few. The rugged materials used in making the Kingsman ZDVRS Chimney Vent Roof Support will stand the test of time, and the tension of the support is more than adequate for keeping your chimney vertical for optimum performance. Thimbles act as transitions when an exhaust or ventilation pipe has to pass through a wall or ceiling. Walls, of course, are often combustible and have combustible material inside of them (insulation, among others), and a wall thimble is a necessary part of complying with local fire codes. The Kingsman ZDVWT Horizontal Chimney Vent Wall Thimble is durably constructed and tested rigorously by Kingsman to guard your wall and inner material from the hot surface of the ventilation piping. Keep your family safe and your home code-compliant with this horizontal wall thimble, and enjoy your fireplace in safety today. If you have a Kingsman stove in your home with a side-facing round termination, don't forget to guard your siding with a heat shield. The Kingsman ZDVSS Siding Heat-Shield for Round Chimney Termination will protect your siding from the risk of combustion to the heat, and your won't need to worry about singing or other heat marks on the side of your house. The shield is made out of carefully-formulated metal that has been tested for efficacy, and the flat-lying and extruding components work together to efficiently protect your siding from catching fire and charring. For use with round chimney termination. If you have a Kingsman stove in your home with a side-facing round termination, don't forget to guard your siding with a heat shield. The Kingsman ZDVSSLR Siding Heat-Shield for Round Chimney Termination will protect your siding from the risk of combustion to the heat, and your won't need to worry about singing or other heat marks on the side of your house. The shield is made out of carefully-formulated metal that has been tested for efficacy, and the flat-lying and extruding components work together to efficiently protect your siding from catching fire and charring. For use with round chimney termination. When you purchase a product from Kingsman, you can be guaranteed that it is an American made product. Although Kingsman develops a variety of products and accessories for your standing gas stove, the ZDVAAF roof flashing with storm collar purchase is one of delicate workmanship combined with lasting durability. This storm collar measures 7 inches in inner diameter. This product has the capability of sealing the vent lengths that protrude from a sloped roof. Also, vertical installations are needed with this product and can be purchased separately. Don't waste your time trying to keep your living room free from soot and ash. Purchase your Kingsman roof flashing and storm collar as soon as possible! When you purchase a product from Kingsman, you can be guaranteed that it is an American made product. Although Kingsman develops a variety of products and accessories for your standing gas stove, the ZDVAF2 roof flashing with storm collar purchase is one of delicate workmanship combined with lasting durability. This storm collar measures 7 inches in inner diameter. This product has the capability of sealing the vent lengths that protrude from a sloped roof. Also, vertical installations are needed with this product and can be purchased separately. Don't waste your time trying to keep your living room free from soot and ash. Purchase your Kingsman roof flashing and storm collar as soon as possible! When you purchase a product from Kingsman, you can be guaranteed that it is an American made product. Although Kingsman develops a variety of products and accessories for your standing gas stove, the ZDVAF3 roof flashing with storm collar purchase is one of delicate workmanship combined with lasting durability. This storm collar measures 7 inches in inner diameter. This product has the capability of sealing the vent lengths that protrude from a sloped roof. Also, vertical installations are needed with this product and can be purchased separately. Don't waste your time trying to keep your living room free from soot and ash. Purchase your Kingsman roof flashing and storm collar as soon as possible! Are you tired of having to continually clean your living room due to discharge from your stove? Kingsman has the solution to your problem. With Kingsman, customer satisfaction ranks high on their list. Kingsman provides customers with plenty of options when it comes to parts for stoves. Parts such as the ZDV7SC storm collar provide your stove with the proper ventilation capabilities that it needs in order to provide you with satisfaction. This storm collar measures 7 inches in diameter. This storm collar not only adds proper ventilation to your stove, but it is also aesthetically designed to compliment your stove as a whole. 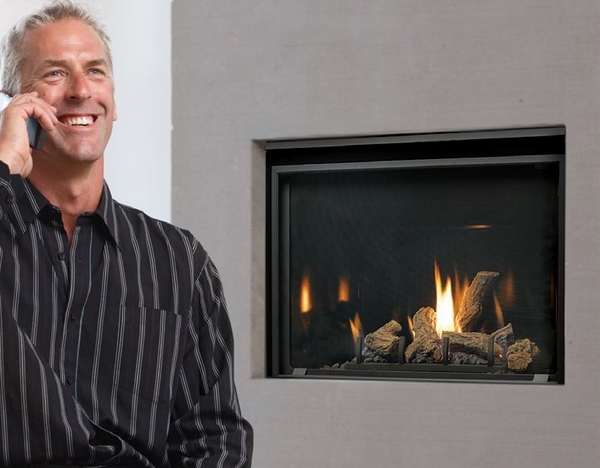 When you need to install a new fireplace or upgrade an existing one, you are guaranteed to find what you need at Kingsman Inc. For over thirty years, Kingsman has worked tirelessly to provide the best of the best in the fireplace industry. This company is known for its designs, engineering, and quality. Each product is manufactured for durability so that you can enjoy your fireplace for years to come. If you have a multi-sided direct vent fireplace, you many need a MDV38IS Insulation Sleeve. This insulation sleeve measures 3 feet and is for low enclosures. It is proudly manufactured in the USA. Tired of having your nice living room filled with ash deposits and soot? Embarrassed to have company over? Kingsman has just answer to your problem. The ZDV4FC chimney vent is just the thing to keep your belongings free of dirt. This chimney vent is equipped with a flex connector that measures four inches in diameter. This handy vent will not only keep your living room from being damaged, but is also flexible enough to keep from being easily damaged itself. The Kingsman ZDV4FC chimney vent is just the thing you need to complete the use of your soot and ash free living room. Tired of having your nice living room filled with ash deposits and soot? Embarrassed to have company over? Kingsman has just answer to your problem. The ZDV7FC chimney vent is just the thing to keep your belongings free of dirt. This chimney vent is equipped with a flex connector that measures seven inches in diameter. This handy vent will not only keep your living room from being damaged, but is also flexible enough to keep from being easily damaged itself. The Kingsman ZDV7FC chimney vent is just the thing you need to complete the use of your soot and ash free living room. With any chimney, the essential parts are necessary to keep it functioning. Kingsman specializes in making sure that you have quality parts for a quality chimney. With parts from Kingsman such as the ZDV4FCL flex clamp, your chimney is sure to exceed every expectation possible. This clamp is 4 inches in diameter. Although the chimney or chimney vent isn't included in this purchase, these items are available for individual sale. Enjoy a quiet evening with a hot beverage in your hands sitting by your completely functioning fireplace, knowing that it is completely functioning due to the utilization of Kingsman chimney parts. With any chimney, the essential parts are necessary to keep it functioning. Kingsman specializes in making sure that you have quality parts for a quality chimney. With parts from Kingsman such as the ZDV8FCL flex clamp, your chimney is sure to exceed every expectation possible. This clamp is 8 inches in diameter. Although the chimney or chimney vent isn't included in this purchase, these items are available for individual sale. Enjoy a quiet evening with a hot beverage in your hands sitting by your completely functioning fireplace, knowing that it is completely functioning due to the utilization of Kingsman chimney parts. The Kingsman ZDV4SS spring standoff spacer is just the part needed for your Kingsman chimney vent. Although both of these products aren't available for purchase in a single package, both of these products are well worth purchasing, even if that purchase is separately. This spring spacer measures 4 inches in diameter and has the capability of withstanding years of use. This spacer will also keep its polishing color. Kingsman also provides various parts and other spacer options for purchase. Don't waste another minute looking into other incapable products developed by unknown companies; update your chimney vent spacer by purchasing them from Kingsman! 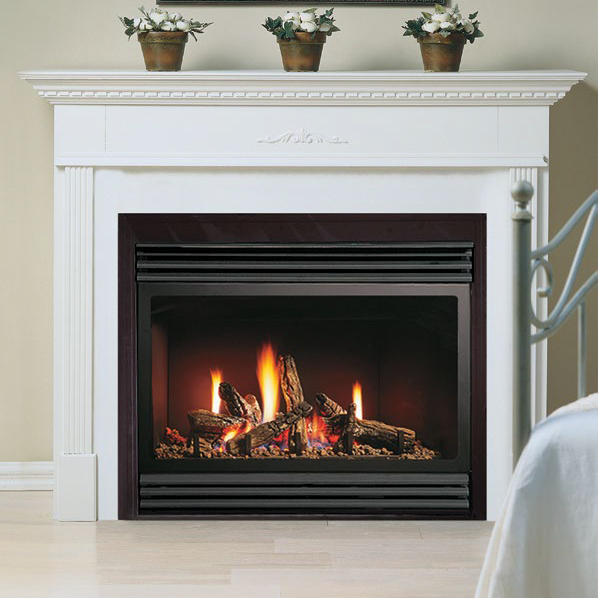 This 33-Inch Kingsman Zero-Clearance Direct Vent Millivolt Gas Fireplace is a reliable clean faced heater rated fireplace featuring a tempered glass front. This fireplace utilizes a highly detailed and durable seven-piece split oak log set and includes a reliable standing pilot valve system which ensures operation even without power. With the millivolt valve, this system can be paired with a full line of remotes or wall switches and has a high/low flame adjustment come standard. This fireplace comes with a safety barrier screen to prevent accidental contact with the hot glass. ANSI/CSA listed for both USA and Canada. BTU Input Ratings: 19,000 Natural Gas / 18,000 Liquid Propane. Efficiency Rating: 53.4% Natural Gas / 51.4% Liquid Propane.